Avalin Construction Co. has been performing these services in Southern California since 1991. What is the Soft Story Ordinance? City of Los Angeles Ordinance No. 183893 requires soft story apartment buildings with four units or more built before 1978 to get seismically retrofitted. Read the Soft Story Ordinance. What is the CEA Earthquake Brace + Bolt program? We are official contractors in California Earthquake Authority's Earthquake Brace + Bolt program, in which you may be eligible to receive $3,000 toward the seismic retrofitting of your home. 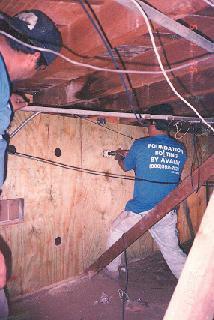 We were selected by the City of Los Angeles to conduct a residential earthquake retrofitting study in Los Angeles. This extensive study administered by Applied Technology Council (a non-profit corporation advancing engineering applications for natural hazard mitigation) is called ATC-50.